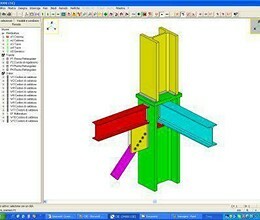 C. S. E. , Connection Study Environment, is a Windows software program completely devoted to the design, study and check of steel structures joints. The C. S. E. project is very ambitious: instead of developing a program which is able to manage only a given number of possible preset joints (cooking recipes approach), C. S. E. faces the steel connection problem in a very very general way: aim of the program is to allow the automatic or semi-automatic check of the steel structures joints (connections) which have been defined via a free placement of the components: joined (members), joiners (welds and bolts), and throughs (plates of the most general kind, stiffeners, angles, generic or normalized cross-shapes trunk, like IPE, HEA, HEB, HEM, W, M, UNP, composed, cold-formed, generic.. really one of the more than 10, 000 cross-section in the archive, or, via SAMBA, any possible composition of these cross-sections). Semi-automatic checks can be added to those, very general, performed automatically by the program, for a real customization of the program work. 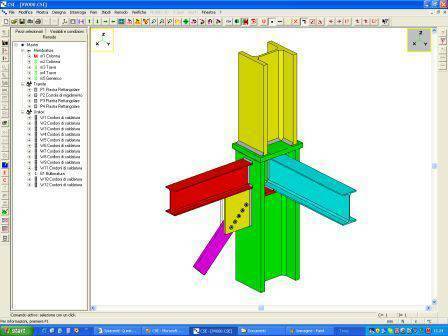 Automatic checks already present in the software manage a very wide class of joints, as there is a simlified fem model able to manage any possible configuration, and bolts, welds, net-sections, bolt-bearing and many more checks are fully automatized. * Connection Study Environment download link provides demo version of the software. Connection Study Environment has been rated 5.0 out of 5 points. A total of 1 votes cast and 0 users reviewed the software.